With so many restaurants to choose from, especially during Restaurant Week, it is difficult to choose the restaurant(s) that will provide the best value, menu selection, and most importantly, will “WOW” you from the minute you walk through the door and throughout your dining experience. 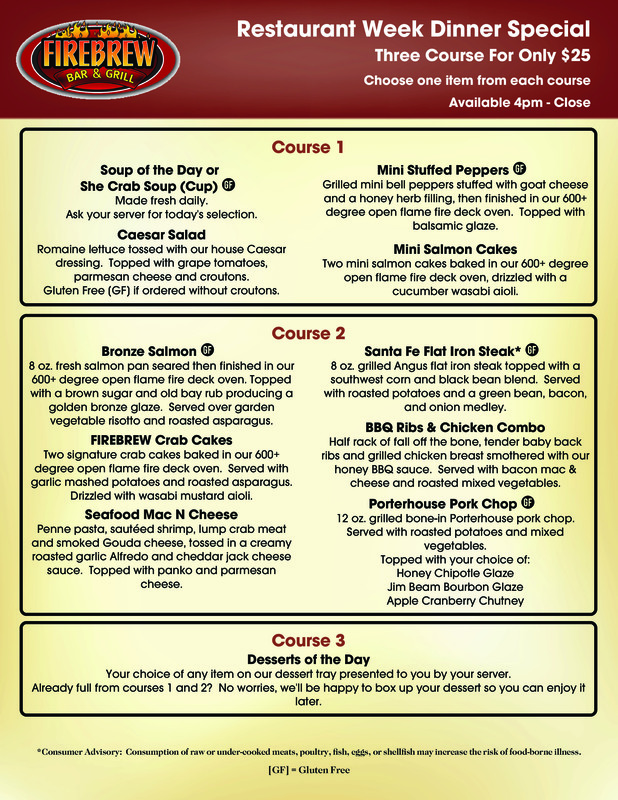 However, once you compare our Restaurant Week menu to ALL other restaurants participating in Virginia Beach’s Restaurant Week, we are confident FIREBREW will be first on your list of restaurants to visit regardless if you are our most loyal customer or are looking to dine with us the first time. Restaurant Week only (02/18/2019 – 02/24/2019). No other discounts/coupons/vouchers may be applied to any Restaurant Week Special. For a dinner restaurant and bar you and your guests are sure to love, come see us tonight! *Consumer Advisory: Consumption of raw or undercooked meats, poultry, eggs, seafood, or shellfish may increase the risk of foodborne illness, especially if you have certain medical conditions.